All transactions are safe and secure with a reliable history in online purchasing behind each of our associates. 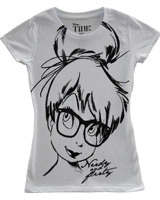 Buy the Tinkerbell Hipster t-shirt to own Peter Pan clothing and merchandise. It appears that the occasionally mischievous Tinkerbell is at it again. Perhaps if Nana had helped raise her like she did Wendy, John and Michael, then she would be a bit more even tempered. If you like the pixie despite her unpredictable nature then you'll love this Disney Tinkerbell tee. She is showing her feisty attitude but looks adorable as usual. No wonder Peter and the Lost Boys let her hang around all the time. Don't miss out on the Disney Peter Pan costumes and Captain Hook outfit either. In addition to the Tinkerbell Hipster tee above, browse the Peter Pan Clothing Gallery for more apparel like men's and women's clothes, kids shirts or hoodies.